Silent Way v2.5.3 (Windows VST format only) is released. • Fixed crash when closing the UI using the Windows ‘X’ button after adjusting plug-in parameters. Silent Way v2.5.1 (all platforms and formats) is released. • Fixed MIDI output on Gates 6/1-6/8 in Silent Way ES-5 Controller. • Enabled full support for the Expert Sleepers MIDI & OSC Lua scripting system. Silent Way v2.5.0 (all platforms and formats) is released. • Added exponential envelope shapes to Silent Way Voice Controller and Silent Way Trigger. • Added FSK (‘tape sync’) support to Silent Way Sync. • Silent Way Learner now supports MIDI channel pressure (aftertouch). 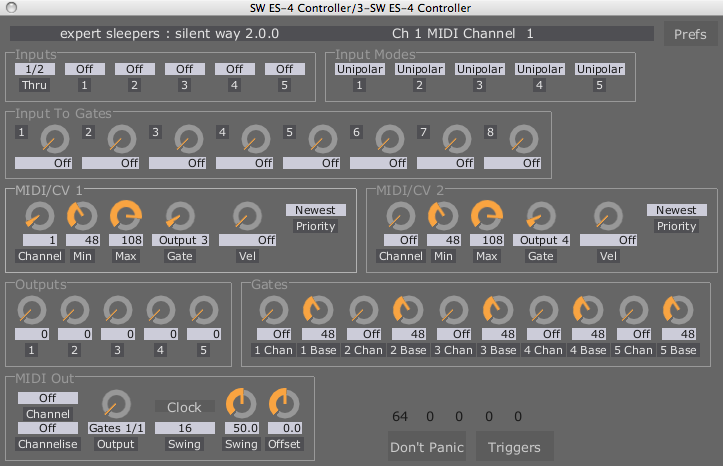 • Fixed an issue with MIDI clock generation in Silent Way ES-4 and ES-5 Controllers. • Fixed the behaviour of the Offset control in certain circumstances in Silent Way ES-4 and ES-5 Controllers, and Silent Way Sync. Silent Way v2.4.1 (Mac OS X only) is released. This update adds Retina-resolution rendering when the plug-ins are used in a compatible host (pretty much anything except 32 bit VST hosts). Silent Way v2.4.0 (all platforms and formats) is released. • Added new Run modes and a periodic reset feature to Silent Way Sync. • Added virtual MIDI input ports to Silent Way ES-4 Controller and ES-5 Controller. • Added ‘Manual DAC’ feature to Silent Way Step LFO. • The Audio Unit version now implements Apple’s newer Audio Component API, allowing usage in modern (post-OS X 10.6) hosts that do not support the older Component Manager API. 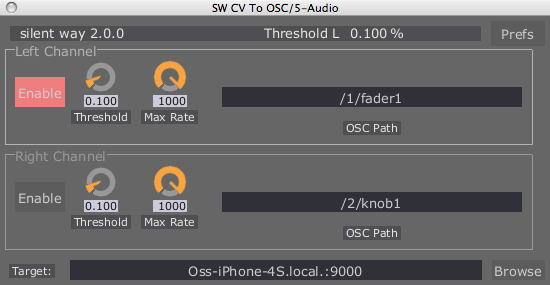 • Updated Silent Way Soundplane’s OSC support for the new t3d format in the Soundplane Client v1.0 and above. Silent Way v2.3.0 (all platforms and formats) is released. • Added Silent Way ESX-8CV Combiner. • Added polyphonic MIDI splitting to Silent Way ES-4 Controller and Silent Way ES-5 Controller. • Added ESX-8CV mode to Silent Way Voice Controller. • Fixed a bug which was causing glitches in the paraphonic envelope outputs of Silent Way Voice Controller in poly master mode. Silent Way v2.2.3 (Windows AAX) is released. This is the first Windows release compatible with Pro Tools 11 (also compatible with Pro Tools 10.3.6). 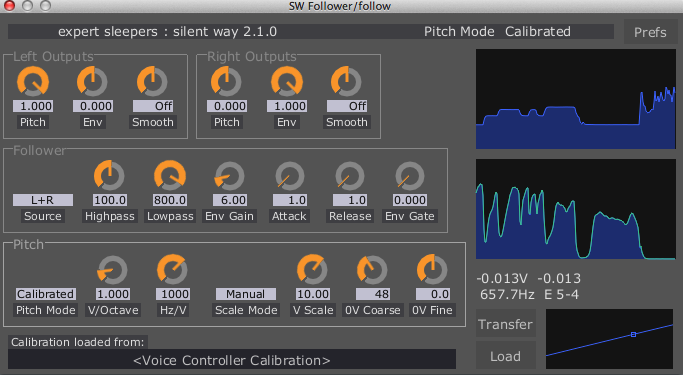 Silent Way v2.2.2 (Mac OS X AU & VST) is released. This fixes an issue with some 64 bit hosts, notably Presonus Studio One. 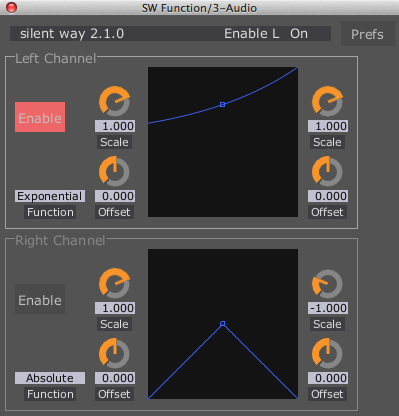 Silent Way v2.2.1 (Mac OS X AAX) is released. This is a 32 & 64 bit release compatible with ProTools 11, as well as maintaining compatibility with ProTools 10.3.6. The first Silent Way Rack Extension (and indeed, the first ever Expert Sleepers Rack Extension) is now released. Silent Way Voice Controller allows you to control your analog synths directly from Reason, in conjunction with a DC-coupled audio interface or an Expert Sleepers hardware module. Think of it as a MIDI/CV converter on steroids - but one that is sample accurate, free of jitter, and which automatically calibrates for perfect tuning. The Voice Controller is the first element of the renowned Silent Way suite to become a Rack Extension. Look out for others joining it soon! Available now from the Propellerheads Shop. Silent Way Rack Extension Teaser on Vimeo. Silent Way Voice Controller, part of the Silent Way plug-in suite, will soon be available as a Rack Extension for Propellerhead Reason. Silent Way offers deep control over analog synthesizers direct from your DAW. - Basic software usage with a DC-coupled interface. - Use of the ES-3 for audio. - Use of the Voice Controller plug-in with the ES-3 module. - Silent Way LFO and Step LFO plug-ins. - Silent Way Quantizer & calibration files. - The expander modules (ES-5, ESX-8GT, ESX-4CV). - Using the expanders to trigger drum modules. - The input modules (ES-6 & 7). - Recording and processing CVs in the computer. Silent Way v2.2.0 is now available in AAX format for Windows (the AAX version for OS X was released last year). • Added Silent Way Logic Project. • Added controls for Interface Categories. • Silent Way Step LFO can now be reset and/or triggered by MIDI notes and/or incoming CVs. • Added ‘Gate Length’ control to Silent Way Step LFO. • Added ‘Random’ feature to Silent Way Step LFO. • Silent Way CV To MIDI, VST version, can now output MIDI direct to the host. 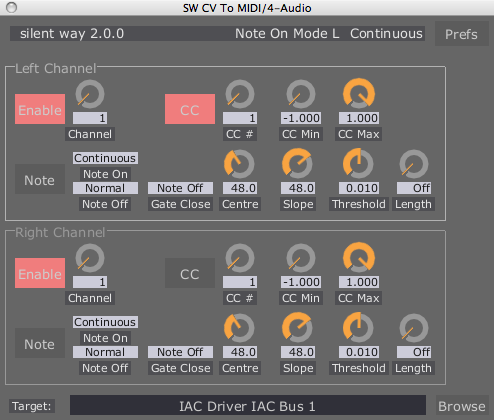 • Silent Way CV To MIDI can now output MIDI directly to Silent Way Learner. • Silent Way Learner now supports MIDI polyphonic pressure messages. • Added ‘SMUX Proof’ mode for Silent Way ESX-4CV Combiner. • Fixed Silent Way Learner, VST and AU versions, to correctly output silence. Silent Way Step LFO new features in v2.2.0 on Vimeo. Silent Way v2 was awarded a 'Platinum Award' (their top honour) by Future Music Magazine, Issue 264 (April 2013). If you're looking to control CV-equipped analogue hardware from the comfort of your DAW, we can't recommend it highly enough. * Added a new plug-in: Silent Way Function. SW Function applies simple mathematical operations to incoming CVs. It is intended to be particularly useful in conjunction with the forthcoming ES-6 and ES-7 modules. * Added "Calibrated" mode to Silent Way Follower, allowing it to use calibration profiles generated in SW Voice Controller, for accurate pitch tracking from incoming audio to your analogue VCOs. * Added "Transport2" sync mode to Silent Way LFO. Like the existing Transport mode, but stops when the host transport stops. * Added a “Transfer” button to Silent Way Soundplane and Silent Way Follower, allowing one click transfer of a calibration from Voice Controller to another plug-in that uses is, without having to save the calibration to disk and load it back in. * Added support for the Expert Sleepers ES-5 module to Silent Way Sync. * Added sustain pedal support to Silent Way Voice Controller. * Fixed a bug that would cause Silent Way Follower to lock up the host application. Silent Way v1.6.3 is released. Only the Windows VST versions are updated. This update fixes a problem some users were encountering where only one plug-in’s UI would work when multiple plug-ins were opened at the same time. Silent Way is a freakin' miracle. Thanks to Expert Sleepers, even something as cantankerous as my old EMS VCS3 can be called into duty for something more than simulating cosmic flatulence. It's an improv exercise, but if you like old Mark Shreeve or Wavestar, you might find it entertaining. I am just blown away by the fact that Silent Way can tame the old thing. What can I say but... w00t. The Silent Way tutorials page has been updated with a new video explaining setup in Digital Performer. The Silent Way tutorials page has been updated with a new video explaining setup in Logic Pro. Silent Way v1.6.2 is released. This update adds multipliers the Silent Way Voice Controller’s envelopes, allowing for very long or very short envelope times. 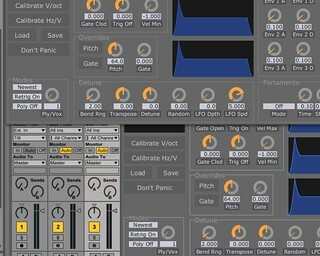 The Silent Way tutorials page has been updated with a new video explaining setup in Ableton Live. The Silent Way tutorials page has been updated with a new video explaining setup in Cubase. Slightly old news, but it turns out Silent Way was reviewed in issue 147 (January 2010) of Computer Music. It got a score of 10/10. Silent Way v1.6.0 is released. - Added support for musical scales to Silent Way Quantizer. - Changed all the plug-in names (that appear in host UIs) from “Silent Way ...” to “SW ...”, so that more of the actual name is visible when space is limited. - Fixed a GUI issue in Reaper on Windows. This video just posted by ‘waveshaper’ shows the Expert Sleepers CV Generator iPhone app controlling an EMS Synthi. We’re proud to announce details of the first Expert Sleepers hardware product - the ES-1 Audio/CV Interface. The Expert Sleepers ES-1 Audio/CV Interface is a Eurorack module designed for use with software such as Expert Sleepers Silent Way. 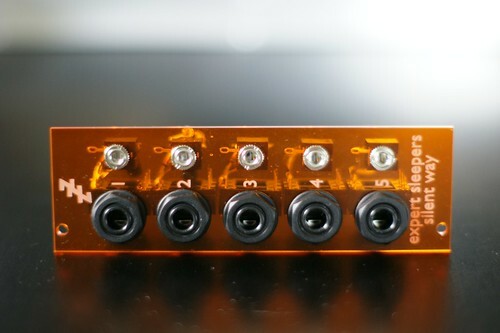 It connects to an audio interface using standard 1/4" jack (balanced or unbalanced) or DB25 (aka DSub) connectors, and outputs CVs to your analogue synths/effects on standard 3.5mm jacks. When used with the Silent Way AC Encoder software, there is no requirement for the audio interface to be DC-coupled. * No requirement for the interface to be DC-coupled. * No need for special cables (e.g. TRS to TS 'floating ring' cables). * No danger of damage to the interface - the ES-1's inputs are completely standard balanced audio inputs. * Much greater output voltage range - up to 9x more than directly connecting a DC-coupled interface via a 'floating ring' cable. For more details, please see the ES-1 page. The previously mentioned Silent Way hardware is progressing well. Here are a couple of photos - you can see more on the Flickr set. Read more on the forum here. This video by wetterberg shows Silent Way controlling a Tiptop Audio Z8000 Matrix Sequencer and using it as an oscillator. This is a pretty unconventional usage but it proves the point that as long as the Silent Way Voice Controller can send out a CV and get a waveform back, it can calibrate it, and doesn’t really care how that waveform was generated or controlled by the CV. We’re happy to report that the first ever Expert Sleepers iPhone app has been submitted to the App Store, and is awaiting approval. The app is part of the Silent Way family, and is called the CV Generator. Read all about it here. Please see this forum thread for news of a prototype active circuit for use with Silent Way AC Encoder. Silent Way v1.5.5 is released. This update extends the range of the Silent Way LFO’s Beat Divisor parameter down to 1/128th notes. This addresses a problem with setting up the VST versions of the plug-in to output DIN Sync. Silent Way has received a glowing review from Sound On Sound magazine, in the May 2010 issue. Silent Way v1.5.4 is released. This update fixes a bug in the Silent Way Quantizer plug-in that could cause the quantized note name to be displayed incorrectly when in ‘Calibrated’ mode. Flamed Raw: Modular Synth Controlling KYMA from bar|none on Vimeo. I’ve made a small interfacing module for use with Silent Way AC Encoder, to show how good it can look and how simple it can be to build. Custom acrylic panel by ProModular. More photos on Flickr here. Silent Way v1.5.3 is released. This update adds a VSTi configuration of the Mac OS X and Windows VST versions of the Silent Way Voice Controller plug-in, so the plug-in can now be used either as an instrument or as an effect. We're happy to announce the release of Silent Way v1.5.2, which adds an important new plug-in to the suite - Silent Way AC Encoder. * your interface must have balanced outputs (almost all do). * you need to make some special cables. 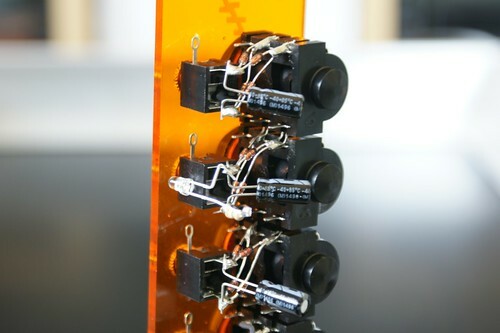 The cables are a very simple job, well within the scope of anyone with basic soldering skills. The microtonal tuning scripts for use with Silent Way Voice Controller have been updated to support Python 2.5 (the version that ships pre-installed with Mac OS X 10.5) as well as 2.6. The wonderful Five12 have posted a tutorial on using Silent Way in their application Numerology. Easy, reliable oscillator calibration for better tuning overall. When generating CV values for automation, you are no longer limited to the 127 steps of MIDI CC messages. This allows you to generate very smooth and accurate control values. You do not have to worry about "saturating" a hardware MIDI interface by sending it too many messages at once. As of version 2.2, Numerology provides integrated support for Silent Way by including direct hardware audio input and output routing in the module. This makes setup very quick, as you don't have to create separate I/O channels to route audio around, as you do in some other hosts. Adam Schabtach (of plug-in developers Audio Damage) has posted a great video showing Silent Way in use with his modular synth. Synth modules in the video are an MOTM-300 VCO, an MOTM-440 four-pole LPF (both by Synthesis Technology), a CGS Wave Multiplier, and a custom-built VCA. Also of interest in this video is the audio interface, which is a Frontier Design Tango modified by Adam himself for DC-coupled operation. He’s documented the mod here. One of the new features of Silent Way v1.5.1 is the ability to load and save calibration data from the Voice Controller. By processing this data, it is easy to retune the Voice Controller to generate arbitrary scales instead of the standard equal tempered scale. We’ve written some scripts to do this. More details here. We're happy to announce the release of Silent Way v1.5.1, which adds two new plug-ins to the suite - Silent Way Quantizer and Silent Way CV To MIDI. * Added ‘Random Tuning’ feature to Silent Way Voice Controller. * Added ability to save and load calibration data to Silent Way Voice Controller. The sample Ableton Live sets on the Silent Way Tutorials page were woefully out of date. They have been updated. We're happy to announce the release of Silent Way v1.5.0, which adds a new plug-in to the suite - Silent Way Step LFO. Silent Way Step LFO is a combination step sequencer and LFO generator. It shares many of the features of the LFO plug-in, but rather than generating waveforms based on simple sine, triangle etc. waves it generates a waveform that the user draws in the GUI. When the waveform is interpreted as a series of discrete values, rather than as a continuous wave- form, then the output is that of a traditional analogue step sequencer. * The Smooth control on all plug-ins is now calibrated in milliseconds, and has a much larger range. * All Mac OS X versions now require Mac OS X 10.4.11 or higher. Thanks to Camille and Navs. Some new videos of Silent Way CV Input and Silent Way CV To OSC, now with the final released versions (the previous videos used early prototypes). The final one is particularly fun - driving software on an iPhone from a modular synth CV. We're happy to announce the release of Silent Way v1.4.4, which adds a new plug-in to the suite - Silent Way CV To OSC. Silent Way CV To OSC translates CV signals (such as those produced by Silent Way CV Input, for example) into OSC messages. These can in turn be used to control all sorts of software and hardware devices. See the Expert Sleepers YouTube channel for some ideas. We're happy to announce the release of Silent Way v1.4.3, which adds a new plug-in to the suite - Silent Way CV Input. Silent Way CV Input is something of a breakthrough in audio interface-based computer/CV interaction, since it lets you get your CVs back into the computer (most other CV-generation software focusses entirely on generating CVs). Moreover this plug-in has no special requirements on the audio interface, and so is not just usable by those with DC-coupled interfaces. This release also fixes an issue with the AU Generator versions of Silent Way DC & LFO (added in v1.4.1) when loaded as mono plug-ins. The Mac OS X VST versions of the Silent Way plug-ins have been updated to v1.4.2. This update addresses an issue where the GUIs would appear in slightly the wrong place in Cubase. The Audio Unit versions of the two Silent Way plug-ins Silent Way DC and Silent Way LFO have been updated to v1.4.1. The new versions add an 'AU Generator' variant to each plug-in, which can be used in Logic on software instrument tracks at the start of the signal chain. More additions to the Silent Way device compatibility page, including the interesting news that the Behringer ADA8000 ADAT expander appears to work - adding a low-cost option for those with non-MOTU interfaces looking to get hooked up to their synths. Edit: oops, false positive - the ADA8000 does not work after all. Sorry if you were getting excited. We're happy to announce the release of Silent Way v1.4.0. * Added Silent Way Trigger plug-in. * Added smoothing option on all outputs of all plug-ins. 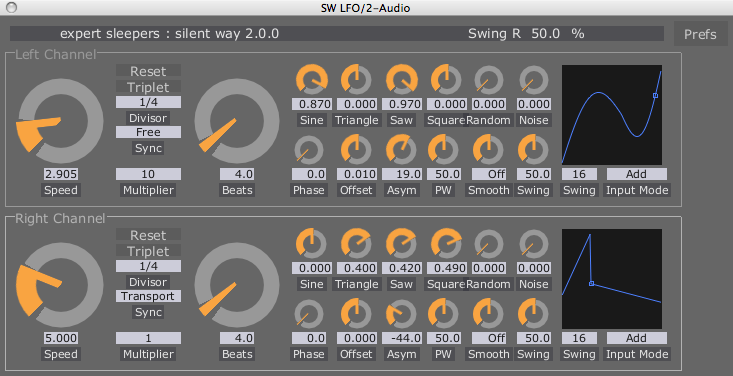 * Added ‘swing’ feature to Silent Way LFO. * Added portamento feature to the Voice Controller. * Fixed a bug that would very occasionally cause the GUIs to be corrupted. Thanks to 'Navs' on the muffwiggler.com forum for testing a number of modules with Silent Way. Read the list here. Some videos have been added to the tutorials page showing polyphonic setup in Live 8, Logic 9 and DP 6. We're happy to announce the release of Silent Way v1.3.0. * Added a per-envelope Reset To Zero control, which controls whether the envelopes always start from zero when triggered, or whether they start from their current value (which is the common behaviour in hardware envelope generators). * Updated all plug-ins for the font changes in OS X 10.6 (see below). I've long promised that more Silent Way plug-ins would eventually join the initial two (Voice Controller and DC). So this is to let you all know that a third plug-in will soon be released, and it's going to be an LFO/trigger/clock generator. There's a thread on the muffwiggler forum here where I've asked for some input on what features people would like this thing to have. So if you have any thoughts, please hop over there and leave your two penn'orth. Another video from Captain Proton, this time showing Silent Way controlling a Yamaha CS-30 synth. This is using the new Hz/V calibration mode added in v1.1.0. We're happy to announce the release of Silent Way v1.1.0 (all platforms & formats). This is primarily an update to the Voice Controller plug-in, though the DC plug-in also benefits from the OSC enhancements. • The Voice Controller AU now has an effect variant so it will work in Digital Performer. • Added new OSC commands (registerOSCPathForParameter() and registerOSCPathForParameterNormalized()) added, primarily for compatibility with TouchOSC. • Output conﬁguration changed from a set of drop-down menus to a full matrix of knobs. • Envelope scale parameters removed, since the same functionality is now offered by the output matrix. • Added new 'velocity' output. • Added velocity-based scaling of envelopes. • Added Hz/V calibration mode. • Areas of the full MIDI note range note covered during calibration are now ﬁlled with ‘wrapped around’ values from octaves that are covered. • Added note priority modes (last/low/high) and retrigger modes (on/off). • Fixed some incorrect envelope triggering behaviours. • The ‘trigger’ output is now slightly longer than before (it was previously a single audio sample). NB the reworking of the output configuration unfortunately means that v1.1.0 of the Voice Controller is not preset-compatible with earlier versions. If you install this version and then load up a song that already uses the Voice Controller, some of the settings (notably the envelopes) will be wrong. This is something we usually go to great lengths to avoid in Expert Sleepers plug-ins, but we felt it was acceptable in this case as most workflows will involve using Silent Way to control a synth which is then recorded as audio before moving on - so to some extent storing presets is irrelevant, since you can't store the state of the synth along with it. Get the update from the downloads page. This functionality will make it into the OSC implementations of other Expert Sleepers plug-ins in due course. As those who've been following me on Twitter (@expertsleepers) will know, I've been making some progress on the Silent Way v1.1 update. This update is currently entirely focussed on the Voice Controller. * AU version has an effect variant so it will work in Digital Performer. * New OSC command added for compatibility with TouchOSC. * Velocity-based scaling of envelopes. * Note priority modes (last/low/high). I have some more stuff to add in, then this will probably be released in the next week or so. After that, I really must add an LFO plug-in. Thanks to Captain Proton for this one. Brandon Daniel has posted a video of Silent Way working with his Alesis IO/26 interface and his Roland SH-101 synth. The VST versions (Mac and Windows) of Silent Way have been updated to v1.0.2. These are identical except now the Voice Controller plug-in is no longer a VSTi. This makes it possible to use in Cubase, since Cubase has problems routing audio to virtual instruments. NB if you were successfully using v1.0.1 (e.g. in Live) you may find you need to slightly reconfigure your song files to take account of this change. We apologise for the inconvenience. The AU version is unchanged, and remains a virtual instrument. A new tutorial showing how to set up the Voice Controller VST from scratch in Live has been added to the tutorials page. The Silent Way compatibility chart has been expanded with some classic old synths including the Minimoog Model-D and EMS VCS3, courtesy of Scot Solida. Update: also added TipTop Z3000, Plan B Model 15 and Doepfer A-111, courtesy of KVR user deastman. Update 2: added Sequential Circuits Pro-One, courtesy of KVR user WMP. No changes since the v1.0.1 version - just now available for Windows and Mac OS X VST. justin3am has posted another video showing Silent Way working with a Doepfer A-110 VCO. Silent Way is running from within Ableton Live to control the pitch of my Doepfer A-110 oscillator and trigger my Doepfer A-140 ADSR via a Motu 828. The pattern at the end is generated by Numerology. justin3am has posted a video showing Silent Way working with his Livewire AFG oscillator and MOTU 828 (original version) interface. Silent Way is running from within Ableton Live to control the pitch of my Livewire AFG oscillator and trigger my Doepfer A-140 ADSR via a Motu 828. The pattern at the end is generated by Numerology. Silent Way v1.0.1 contains an update to the Voice Controller plug-in allowing it to be used in Logic Pro. Since there are far more audio interfaces and synth modules in the world than any one person or even company is ever likely to own, it seems unlikely that Expert Sleepers will personally be able to test every combination. * buy Silent Way (you don't qualify if you use the demo version to do the below). * send us the details of your system (computer, host application, audio interface, synth modules). * put up a video on YouTube demonstrating that Silent Way works with your stuff. * a coupon for $50, good for one purchase from the Expert Sleepers store, if you do the above and you're the first to document the successful use of Silent Way with a particular audio interface or synth module. This offer will run for a limited time only, so get testing! We're proud to announce the release of Silent Way, a suite of plug-ins designed for use as part of a modular analogue synthesiser system. The plug-ins produce no sound themselves, nor do they process sound - rather, they generate signals to be used as control voltages (CVs), which can be patched into the control inputs of oscillators, filters, VCAs etc. of an analogue system. * full MIDI and OSC control. * sample-accurate handling of MIDI note messages. Silent Way DC is a simple plug-in that generates constant output signals. It is intended to be used in conjunction with parameter automation (via MIDI or directly by the host application) to generate varying signals. For example, you could use it as an LFO where you draw out the LFO waveform in your host’s parameter automation GUI. Silent Way Voice Controller is a virtual instrument plug-in designed to directly control an analogue synthesiser by generating the appropriate CV and gate signals via an appropriate audio interface. By listening to the synthesiser’s output signal, the plug-in is able to calibrate itself to generate the appropriate pitch CV for the incoming MIDI notes. As well as the basic pitch and gate signals, the plug-in can generate three multi-stage envelope CVs which you can feed to VCAs, VCFs etc. in your synth. Silent Way is available immediately in Mac OS X Audio Unit format, priced at $49. Mac and Windows VST formats to follow. Read more here; download the demo here.